If you are a Customer Thermometer account holder (Jumper account or above) and use Outlook (Office 2000 and above) for personal or business use, then you now have everything you need to add an Outlook email signature survey to your signature or footer. 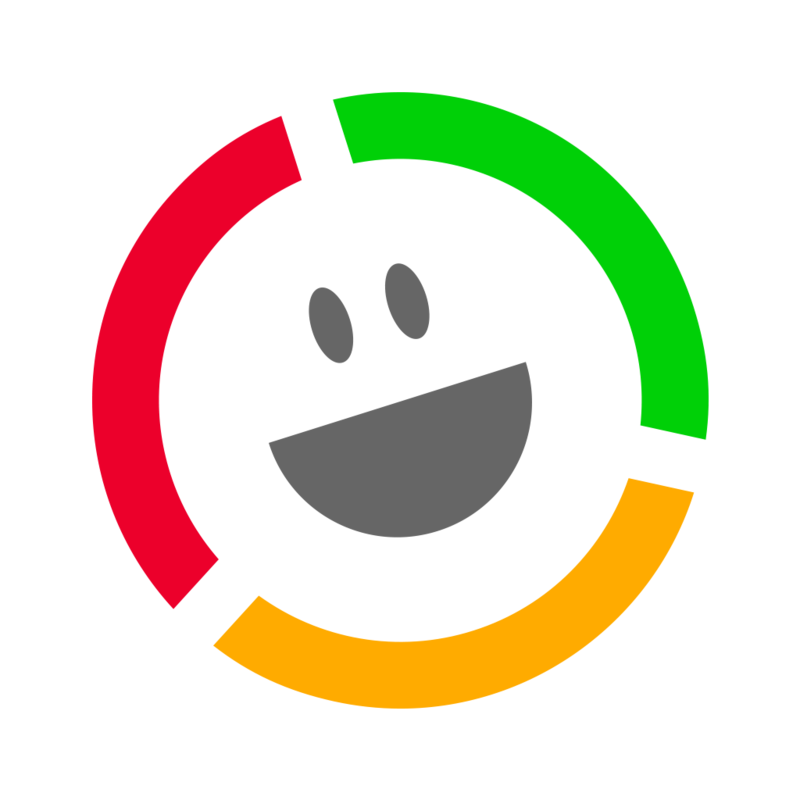 If you’ve never used Customer Thermometer before – watch this first video. We take you through the simple set up process and show you a few tricks to customise things further – including using your own icon set. We also show you how to create an Embedded Thermometer and then integrate the unique hyperlinks code generated by an Embedded Thermometer into your signature. Following on from the video demo above, we’re going to assume that your Outlook Thermometer and Landing Pages are set up. 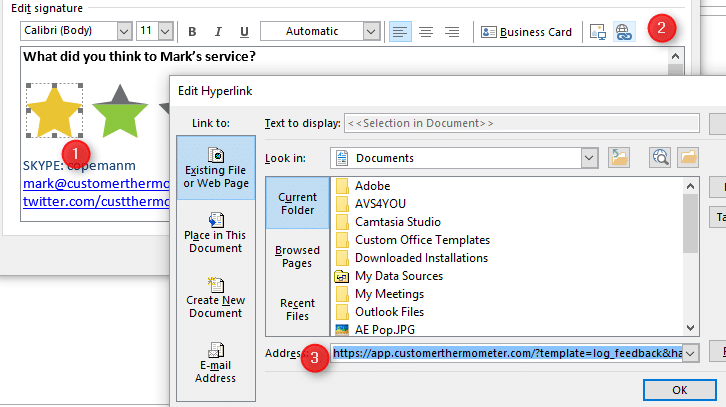 Let’s now take a look at creating your Outlook signature Thermometer within Outlook itself. Firstly, you need to right click and download each of the 4 icons which are displayed. If you change your mind, close the popup and head back into the Thermometer area and choose a different set (or upload your own). Download each of them to your desktop, ready for adding to your signature. 2 Create a new Outlook signature. 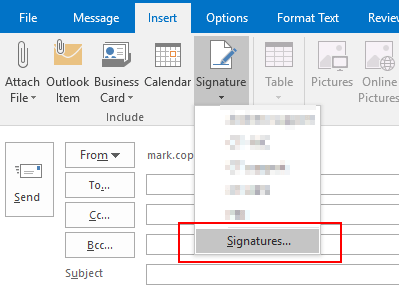 To create a new signature or edit an existing one, firstly, create a new message within Outlook. Feel free to use whatever question / formatting you would like to design your signature. The final piece of the jigsaw is attach the correct links to the correct icons. Let’s take another quick look at the pop up. Note that with Outlook signatures, the Email field will be anonymous initially (as we are unable to detect recipient emails in this mode). However, if you take a look at the email prompt option below – if a recipient enters their address, the anonymous field will be overwritten by their actual address. First name, Last name and Company name are NEVER used by recipient data in this mode of operation. You could use these fields for your agent names if you wished. 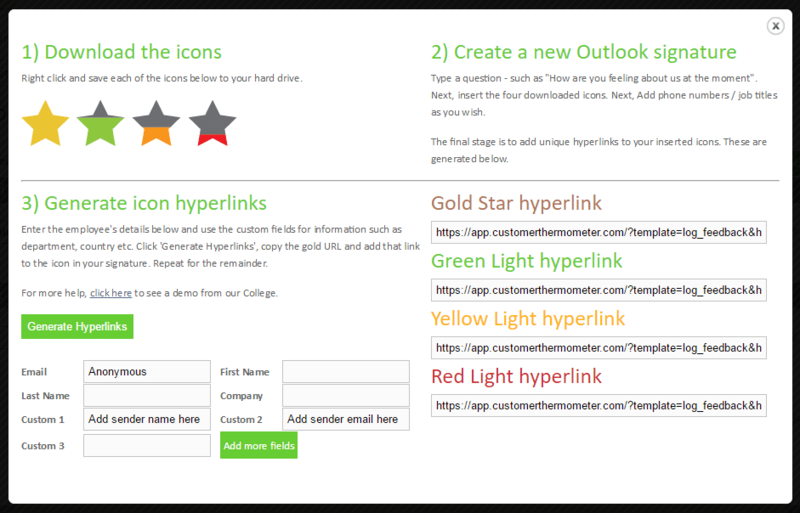 Firstly, take the opportunity to customise the hyperlinks for the signature you’re setting up. You might choose to add the name, department, location perhaps within the custom field boxes. By adding the sender’s email address to say, Custom 2 – it would mean you could trigger comment alerts to be sent to [custom_2]. Click here for custom field usage. Once the fields have been entered, click the “Generate Hyperlinks” button and 4 links will appear. Make sure you attach the right links to the right images! Save your signature, and you’re done for that sender. For your next colleague to be added to that Thermometer, change any fields and regenerate the links again and pass them on. 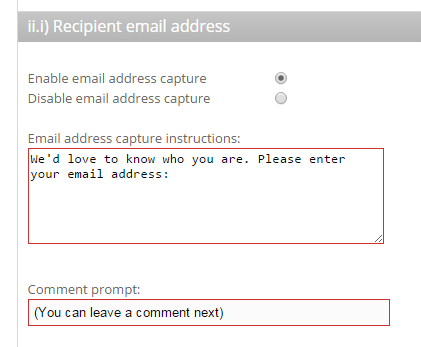 Option: Prompt for email address. Outlook Thermometers are initially anonymous. This is a physical limitation of Outlook itself – the signature file is static and cannot contain variables to integrate recipient information. It is now possible to prompt for an email addresses following a click. You can choose whether you would like to enable this per Thermometer. By default, it is disabled. In this section, you can customise the prompt text for your tone or language. 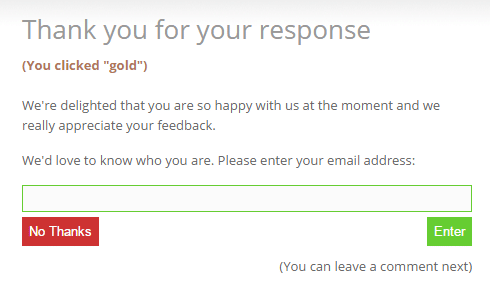 You can also customise the Comment prompt – ensuring a recipient knows they can leave a comment – even if they choose not to leave their email address. If they choose No Thanks, the comment box will then be displayed (if enabled). If they enter their address – that address will overwrite the initial email address data on the response. You might have chosen to add the Outlook user’s email address in the email address field on set up. This new data will overwrite it. As an aside, we would advise adding the Outlook user’s email address to a Custom field when generating your Thermometer HTML code. You’ll then be able to create League Tables of data if required. If email capture is NOT enabled, then alerts WILL come through for all responses. If email capture IS enabled, then alerts will only come through if an email address is entered on the landing page. If comments are enabled, then alerts will come through for all comments, regardless of whether an email was entered. Need more help or advice? Get in touch.